Janet Mills, the state's first woman governor, will have majorities in the Legislature to combat gridlock. 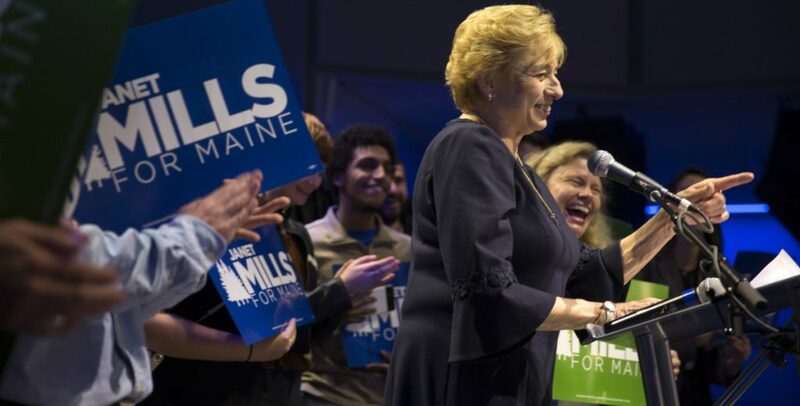 Tuesday was a big night for Democrats and for women in Maine, as the state’s voters elected Attorney General Janet Mills to be their governor, the first woman in history to hold the office. Democrats also seized control of the state Senate, winning as many as 21 seats (including nine held by women) in the 35-member body. The Democrats built a robust 89-member House majority, in which women outnumber men by 49 to 40. Incumbent House Speaker Sara Gideon easily won her race to represent Freeport and is considered a shoo-in for another term as the presiding officer. No current member of Republican leadership in either the House or Senate will be returning to serve in the next Legislature, either because of term limits or through losing an election. It was the biggest swing in party control since Republicans took the House, Senate and governorship in 2010, and it will likely represent the largest number of women ever elected to serve in the Maine Legislature. But although the change was sweeping, it did not come with the level of high drama that we have gotten used to since Paul LePage burst on to the scene in 2010. The four candidates for governor this year – Mills, Republican Shawn Moody and independents Terry Hayes and Alan Caron – ran substantive campaigns that kept the personal attacks to a minimum. These contenders all wanted to win, but at times each of them took the opportunity to remind us that their opponents were not bad people. This sentiment was expressed in Moody’s concession speech around midnight Tuesday, when he graciously congratulated Mills and her supporters. As the votes came in, it was clear that this election would not be a nail-biter. Mills won convincingly and is likely to finish with more than 50 percent of the vote, the first Maine governor to pass that mark since Angus King’s re-election in 1998. That doesn’t mean she will be universally beloved, but she shouldn’t have to face the kind of resistance that her last two predecessors received after each of them won elections with less than 40 percent of the vote. Mills ran a focused, issue-based campaign that should serve as an agenda for the new Democratic-controlled Legislature. She promised to move forward with Medicaid expansion at the earliest opportunity, implement a detailed plan of action to combat the opioid epidemic and dedicate resources to rebuilding the state’s infrastructure, including the expansion of broadband internet service. Mills has the mandate and the experience to make a smooth transition in January. With a strong majority at her back, the dysfunction that has plagued Augusta over the past four years could be over. If that is what happens, Tuesday will be remembered as a very big night for Maine.